main house and guest cottage in lower kingsburg, nova scotia. 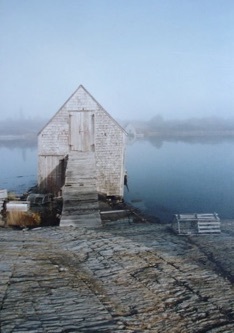 in materials and form, the project draws from the historic fish stores that still stand along the coves of coastal nova scotia. I must commend you on a truly fascinating design. My wife and I love it. I spent a week renting nearby and staring at your creation from across the bay, and knowing that that it was either going to be that home or I would end up being haunted by it and would have trouble renting there in the future because it would piss me off to no end if I did not end up owning the home you designed.